Everything’s bigger in Texas. That’s not always true, but the city of Houston certainly is. As one of the biggest and fastest growing cities (if the Houston metropolitan area became its own state, its population would rank in the top 20), Houston also presents our synod with an especially big evangelism opportunity. While WELS does have a few congregations in that area, we do not have any near the heart of Houston—at least, not yet. Over Winterim, Professor Kock and eight seniors (myself included) traveled to Houston and gained invaluable firsthand experience of what goes on when our synod starts a mission congregation as we worked with a core group of WELS members seeking to start a new mission there. We seminarians learned about the area and people who live there by observation, formal interviews with people who especially have a pulse on the community, and informal conversations with the city’s residents. 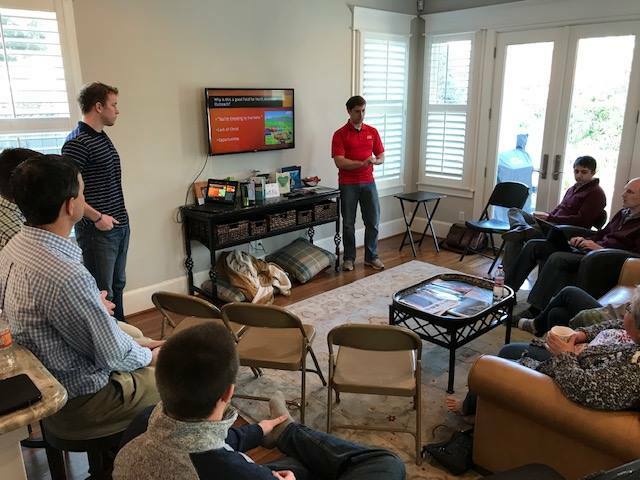 At the end of the week, we had an opportunity to present our findings to members of the South Central District Mission Board and the core group of members in order to help them as they prepare to make this new mission a reality and reach out to many souls in Houston with the good news of Jesus. But probably much more beneficial than our findings and suggestions were to them was the mission and evangelism experience which we gained. We got to go into a new setting and expand our horizons as we took note of the challenges to building relationships and sharing God’s Word with people we don’t know and who may have a very different culture or lifestyle than we do. We got to put into practice some evangelism methods that may have been uncharted territory and somewhat awkward for some of us as we started conversations with strangers in coffee shops and parks. In other words, we received some awesome hands-on experience in thinking about different ways to reach people with the same saving gospel message in different circumstances. And best of all, we all had the privilege to do just that as many of the conversations opened up an opportunity to share the good news of Jesus Christ and the forgiveness from sins he has won for all! We don’t know what God has in store for a potential new mission in Houston or for us in our future ministries, but we thank God for this amazing privilege to play a small part in the gospel outreach there. We are extremely grateful for the evangelism experiences and ministry encouragement we received on this trip, and we’re excited to carry those with us into our public ministries. Because no matter where we end up serving or where you may be—whether in an established congregation or new mission, whether in a big city or small town—a huge part of our mission as Christians is to connect with and reach out to people in the community with the peace and hope we have in Jesus, our Savior from sin.